What if you sprain your ankle on a trail run? Today on the Doc On The Run podcast we’re going to talk about the basic thing you should think about if you believe you need treatment after you sprain your ankle on a trail run. the time he feels his ankle give way, his arms are already outstretched to brace for the fall. The trail is soft and nothing hurts but his ankle. Brushing off sand and eucalyptus leaves, he notices the ankle starting to swell. Throbbing pain begins to build into a crescendo. He gets up and slowly hobbles back to the car. By the time he gets to his house in Mill Valley, he can barely walk. He tries to figure out if he should head straight to the ER or call his family physician in Sausalito. Not wanting to bother his doctor with “just an ankle sprain” he heads to the ER in Marin. But that’s it. After half a day of waiting and gets a brace, a generic ankle sprain instruction sheet and advice to make an appointment with a specialist if the ankle doesn’t get better. A week later his ankle is still swollen, the foot and toes are black and blue and he can still hardly walk, let alone run. To make matters worse, he gets a bill for over $1,500 for the ankle x-rays and emergency room visit. He wonders if there is a better way and searches online for the best ankle treatments in the Bay Area. When he finally does sees the ankle doctor, he is told he has a subtle break in one of the bones in his ankle called a lateral process fracture. It needs to be treated. The doctor explains that there are several types of broken bones that often get missed and misdiagnosed in hospital emergency rooms. Without the proper care, his ankle would just continue to ache. He realizes he just wasted over a thousand dollars and a week of his time with the ER visit. In 2009 a research study on ankle sprains was published in the medical journal Clinical Orthopaedics and Related Research. The researches reviewed 119,815 emergency room visits and found that 36% of all emergency room visits were a strain or a sprain and ankle sprains certainly are one of the most common injuries in the ER. 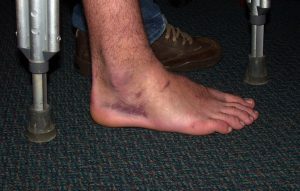 Now, interestingly the study also reported that there were only 49 ankle fractures out of every 100,000 ankle injuries. When I was in medical school we were taught all sorts of “facts” based upon research studies and statistics. One of these “facts” was that a small fracture in the ankle called a “lateral process fracture of the talus” only happens about one percent of the time. We were taught that the lateral process fracture is a rare injury and almost never happens. Well, in my first few weeks of my surgical residency training, I was on an Emergency Room rotation and I found several lateral process fractures. But I had not seen several hundred ankle sprains. So the numbers didn’t make sense. So I decided we should see if this numbers that were taught were really real numbers or not. I wrote up a research proposal, presented at the University Institutional Review Board and got approval to conduct an extensive study of ankle injuries. We looked at all the ankle X-rays, ankle MRI’s, and ankle CT scans that were performed at the University hospitals and clinics during a three year period. What we found was that lateral process fractures occurred almost 10% of the time when there was a suspected ankle sprain. Even more disturbing was the fact that many of these lateral process fractures get missed and misdiagnosed. About a year later, I was working in an orthopedic surgery clinical seeing patients and performing foot and ankle surgery as part of my training. One morning I was told there is a 32 year-old guy who was a healthy runner with chronic ankle pain seeking a second opinion. I opened the door to the treatment room, introduced myself, and looked at the x-ray films hanging on the x-rays view box and said “Hey, you have a lateral process fracture!” I said and he started to cry. So even though many published studies and articles in medical journal studies have reported that lateral process fractures are subtle and can be hard to detect, they still get missed. Initially we presented the results of that study at the Annual Scientific Conference of the American College of Foot & Ankle Surgeons. Because we won an award for that research, I still get invited to speak at medical conferences to teach podiatrists, sports medicine doctors, and foot and ankle orthopedists how they can make sure they don’t miss these fractures. So what do you think? Were there really no patients at all in his office with lateral process fractures during that 10-year period? Is it possible that he, like many others doctors, just missed them? The problem doctors have when a trail runners rolls her ankle is that ankle sprains, ankle strains and ankle fractures all have basically the same symptoms. Initially there is pain, tenderness, swelling, redness, brushing and maybe even the inability to walk or bear weight. How does your doctor correctly diagnose the condition? How does the doctor really make sure you don’t have some subtle fracture that will ache every time you try to run? Many people presume an x-ray will show the doctor any fracture in the ankle. But that’s just not true. In fact, Ottawa scientists reported only 15% of fractures are diagnosed with x-rays. The first problem is Emergency Room Doctors are taught to follow a set of guidelines called the Ottawa Ankle Rules to help them decide whether or not an ankle might be broken, or just sprained. The huge study that we conducted at the University of Utah showed that certain x-ray findings suggest lateral process fractures of the ankle are more than ten times more common than once thought. In addition, these fractures are often thought to be incorrectly diagnosed as just an ankle sprain. You don’t have to be a doctor to know that it’s not good to walk around on a broken ankle. The current standard of care in emergency rooms in the US is to evaluate the patient following the Ottawa Ankle Rules and then, if warranted based on those rules, take x-rays of the ankle to make sure there is no obvious fracture. Then the ER doc sends the patient hobbling away with an ankle brace and instructions to see an ankle specialist like an orthopedist or sports medicine podiatrist. The problem is that delayed treatment often leads to delayed recovery. The delayed recovery leads to continued ankle pain, and even unstable ankles that can degenerate into ankle arthritis, and ruining your ability to enjoy running. Not only is there a cost to your running enjoyment, there is a financial cost as well. In 2013 a huge study funded by the NIH looked at the actual cost of an emergency room visit when you sprain your ankle. The researchers looked at 8,303 actual emergency room encounters, representing 76.6 million visits. The average emergency room bill was a sprain or strain was $1,498. They also reported that the cost of treating a sprained ankle could range anywhere from $4 to $24,110! Come on…a $24,000 bill for rolling your ankle on a trail run…really? Every time I see a runner who rolled an ankle, went the ER, and then didn’t get better they tell me the same thing. They had to wait all day, the doctor spent 2 minutes with them, and then they got an ACE wrap or some flimsy brace, and a huge bill. A week later they could still barely walk so they call me. They call me because they obviously didn’t get the correct treatment. One reason for not getting better is doing the correct treatment in the wrong way, but a worse situation is if you have been misdiagnosed. Just like that poor guy who was told he was nuts, any patient who is misdiagnosed with a sprain is not going to get the best treatment if there is an undiagnosed fracture lurking there. An ankle sprain is a soft tissue injury. An ankle fracture is a bone injury. They are different tissues. They are different injuries. And they have different treatment. If you go to the emergency room, the doctors are likely to just follow the Ottawa Ankle Rules and see if you need x-rays. All the Ottawa ankle rules say is that if you can walk 4 steps without assistance (even it hurts to walk), and you have no pain when the doctor pushes on certain structure in the foot, then it so unlikely you have an ankle fracture, you don’t even need x-rays. So if the emergency room doctor sees you walk or limp and pushes on those 4 structures without causing pain, then you get instructions to rest, ice, wrap the ankle with a compressive bandage and elevate the foot. Oh, and in case you are wondering what kind of treatment costs $4, an ACE wrap at your local drug store costs $4. So if you check the ankle yourself, following the Ottawa Ankle Rules, and then wrap the foot with the ACE bandage, ice (which is free at home), elevate (which is free on your couch) and rest (which is also free on your couch), the total cost is $4. But if instead you go to the emergency room and let the emergency room doc poke on these four spots and give you an ACE bandage, that same treatment costs you half a day of waiting and an average of $1498. The final piece of advice the emergency room doc will give you is “If you are not improving within a couple of weeks, follow-up with an evaluation from a foot and ankle specialist.” Then they hand you that huge bill. Rather than go to the ER, where you will have the longest wait, the highest bill and the least specialized ankle care, why not see a real ankle expert who will help you faster, charge less, and provide more ankle-specific advice. It seems to me that if you can understand the Ottawa Ankle Rules, apply an ACE wrap, ice the ankle, elevate and rest all on your own, you can basically get the emergency treatment, all on your own, without the trip to the ER, without the ludicrous wait and without the ridiculous ER bill. According to the Illinois Podiatric Medical Association, podiatric physicians are four times less likely to use expensive hospital-based services than other doctors. The reported average cost of treating a sprained ankle in a podiatrist’s office is only $400 – $500, which is less than 1/3 of the cost in the emergency room. Years ago I created an ankle sprain self-diagnosis video that helps runners like you understand exactly what a doctor does during an ankle sprain visit. You can get that video instruction and a PDF of the instruction free on the DocOnTheRun.com website. We’ll put link to it in the show notes so you can download it. Of course if you do the stuff the ER docs recommend and you don’t get better after a few days, you can still follow-up with a foot an ankle specialist. So just by reading about ankle sprains and viewing the video on what doctors do to diagnose ankle sprains, this woman was able to figure out what she really needed to do to make sure she was doing the right thing. She didn’t have to go to the emergency room to get help. Today there are sports medicine doctors and ankle sprain experts who reserve spots in their schedules for ankle sprains every day. These doctors treat ankle sprains like real emergencies without the cost of an emergency room visit. While a rolled ankle may not be the sort of emergency that emergency rooms were designed for, an ankle sprain is an emergency to a runner. Active people need strong pain-free ankles. They need to find the best ankle sprain treatment in order to get rid of the swelling and get back to running pain free. I even take the rapid evaluation treatment approach one step further by offering remote consultation via telephone, web-conferencing, video-chat, and even house calls. So there is just no need to hobble around all over town. You can actually have a doctor in your home in less than hour for a fraction of the ER cost. If you do a remote conference consultation via video-chat, it costs even less. And I am certainly not the only foot and ankle specialist who offers this sort of care. You can get the same thing, no matter where you are…California, Texas, Hawaii, the Philippines, wherever you are! If you have an ankle sprain, you can skip the emergency room wait just by searching for a local ankle sprain expert. As long as you will need to see a specialist anyway, why not see the best ankle doc to begin with! The true ankle experts are orthopedists and podiatrists. Podiatrists only treat feet and ankles. Because of this, they have the most specialized knowledge. If you sprained your ankle, you should see a true ankle specialist today. Not only will you get the most thorough evaluation, you can also skip the 6 hour ER waiting time. In addition, you can save a small fortune by avoiding the emergency room bill. If at all possible, look for a doctor who is not only an ankle expert, but a running expert as well. That way you can recover and rest assured that your doctor will help you get back to running as quickly as possible. Segler CP, Anderson M, Huff DJ, Crim JR. 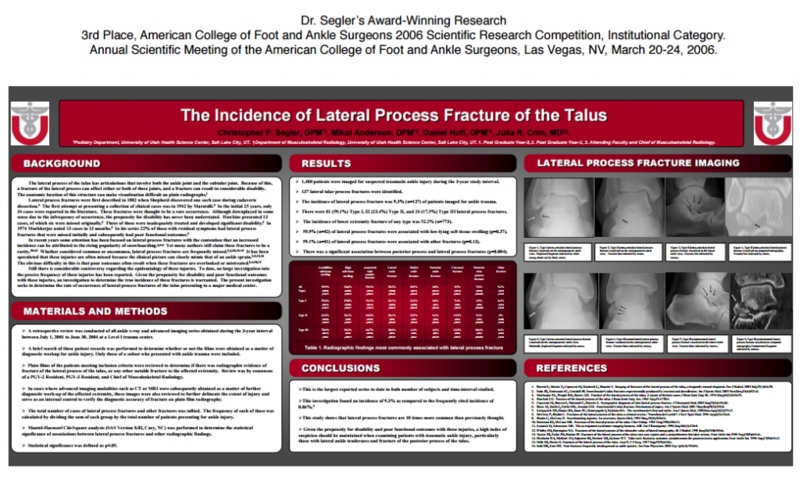 The Incidence of Lateral Process Fracture of the Talus. Annual Scientific Meeting of the American College of Foot and Ankle Surgeons, Las Vegas, NV, March 20-24, 2006. Awarded 3rd Place, American College of Foot and Ankle Surgeons 2006 Scientific Research Competition, Institutional Category. Bonvin F, Montet X, Copercini M, Martinoli C, Bianchi S. Imaging of fractures of the lateral process of the talus, a frequently missed diagnosis. Eur J Radiol. 2003 Jul;47(1):64-70. 2. MukherjeeSK,PringleRM,BaxterAD. Fracture of the lateral process of the talus. A report of thirteen cases. J Bone Joint Surg Br. 1974 May;56(2):263-73. Heckman JD, McLean MR. Fractures of the lateral process of the talus. Clin Orthop. 1985 Oct; (199):108-13. Tucker DJ, Feder JM, Boylan JP. Fractures of the lateral process of the talus: two case reports and a comprehensive literature review. Foot Ankle Int.1998 Sep;19(9):641-6. Mills HJ, Horne G. Fractures of the lateral process of the talus. Aust N Z J Surg. 1987 Sep; 57(9):643-6. Judd DB, Kim DH. Foot fractures frequently misdiagnosed as ankle sprains. Am Fam Physician. 2002 Sep 1;66(5):785-94.